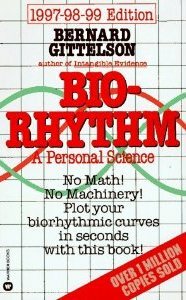 Then there are those that say biorhythms are pseudoscientific hooey. I tend to fall in this camp myself. I find it hard to imagine the human clock would stay in sync that accurately life long when it can’t even get the menstrual cycle that regular which has the moon to help it stay in sync. Then again some fish and corals have extremely accurate internal clocks.